[embed]https://vimeo.com/139228546[/embed]One of ReACT's most cost-effective and culturally relevant projects is the Home Based Care (HBC) program. Instead of investing large funds into costly infrastructure and removing a child from their local community, orphaned children are cared for by extended family in a familiar place. ReACT's role is simple...to monitor the child with one of our Kenyan trained social workers (we call them "mentors") and to provide the basics for the child on a monthly basis. Child care simply cannot be any more cost-effective or culturally relevant than that! One of ReACT's most cost-effective and culturally relevant projects is the Home Based Care (HBC) program. Instead of investing large funds into costly infrastructure and removing a child from their local community, orphaned children are cared for by extended family in a familiar place. ReACT's role is simple...to monitor the child with one of our Kenyan trained social workers and to provide the basics for the child on a monthly basis. In the last two weeks, the ReACT Kenyan team has been busy providing some much needed basics for many children in both our Home Based Care program as well as the surrounding community. I for one know (my wife will verify this!) that a good sleep is not optional if I expect to function, let alone accomplish anything during the day. Rest is not wasted time but rather imperative to proper daily function and yet many Kenyan families routinely sleep on the floor of their huts instead of a proper bed. Recently, the Kenyan Team provided mattresses for the families in the Home Based Care program and they were received with joy and thankfulness! Too often its the "little things" that make a huge difference. 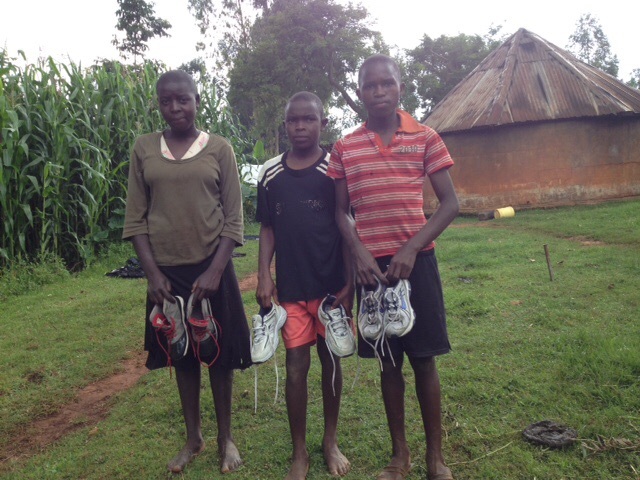 Similarly, this week many children in the Home Based Care families also received a new pair of shoes. This too may seem like a luxury to many of these children but how many of us would think it optional to go bare foot instead? We are grateful to all our friends and partners that understand that its the small things in life that often make the biggest difference. The children of Kenya say "Asante"! The following is a report from Anne our full-time Kenyan social worker. She will be highlighting a different family each month for us on our web site to keep these faces and families in front of you. What a blessing Anne and Mark are to this work! The Kiminini family is one of the Home Based Care families that ReACT took over sponsoring this year and we are so blessed to be able to do so! Thank you SO much to our sponsors and those of you who stand so faithfully with us in caring for these children! "This is kiminini family which has come a long way and thanks be to the almighty God. The children you see in the picture were very young as we took them to the program. The two beautiful girls were in class one and now they are in grade 7. The boy in yellow i cant imagine the lord preserved his life. He is the boy that in HIV positive in the home but he has healed and only using medicine to the minimal. At some point we thought we would bring him to Veronica home but he has amazed us on how he has been improving every day. He is in class one (grade one) and looking at his book he does not have any wrong in his work. Lord we praise you for Benard. The girls are Lucia and Maureen. Blessings Anne"